While certain things in life are predictable, many are not. Jeff and I mapped out, for example, our first two pregnancies and had our babies right on schedule. Graduate school for me, medical school for Jeff—these were steps we prepared and planned for in our lives. But other things came as surprises. We were not people who “always knew” we’d adopt, for example; yet that blessing in our lives has been especially lovely. And I never could have predicted I’d have a child die, much less that it would be due to medical negligence and that I’d witness it all, as occurred with our daughter, Talia. I’ve written on this website about Mike Baker’s feature in the Seattle Times and the way his article changed the trajectory of our lives; and while that’s true, the fact that he chose to focus on Talia was not actually the surprising part for me. Talia was captivating, wholesome, lovable: it was hard not to respond to her; and yet she died in such an outrageous way. It made sense to me that, once discovered, hers would be a story people were drawn to—even as the nightmare was revealed—because Talia herself was so winning. What I didn’t anticipate was the number of relationships that would grow out of that article. A Lost Voice, the Seattle Times feature on Talia, rushed across the internet, filling the inboxes of many, many hospital CEOs across the country. You can imagine the stress for a CEO when reading about their own worst nightmare; and, indeed, the CEO at Swedish lost his job over the scandal in Seattle, which grew out of Mike Baker’s fine investigative journalism and the personal reach of Talia. One CEO in California read the story and then forwarded it to his Chief Operating Officer, saying, “Tell me this couldn’t happen here.” And rather than ducking behind false reassurances or pompous platitudes, Jon Friedenberg, COO of Marin General Hospital, understood that aspects of what happened to Talia occur in hospitals everywhere, and that he needed to redouble the efforts at Marin General to ensure such a tragedy would never take place there. And so Jon wrote us a beautiful letter (in contrast to Swedish who didn’t send us any letter, beautiful or otherwise), and invited us to tell our story at his hospital. 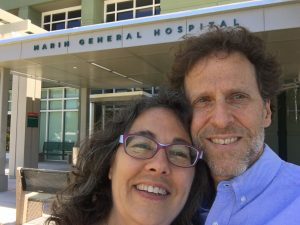 We were not public speakers and were not looking to promote ourselves as such, but the opportunity to participate in helping Marin General become a safer hospital for its patients, and the way Jon made clear that not only would our story be a powerful one for them to hear, but that they were actively interested in hearing it—that felt right to us. We have no interest in being anyone’s entertainment. But, given the reality of what happened (or didn’t happen) during Talia’s hospitalization where nobody listened to Talia or to us, the idea of a hospital filled with people interested in listening and paying attention—that had an air of unreality. Yet here at least was an organization actively seeking out ways to practice medicine safely, to be safer tomorrow than they were yesterday. (Our presentations were only one piece to this puzzle, along with ongoing policy changes and culture shifts taking shape there.) It was also gratifying that this opportunity came out of a developing relationship—the very connection that was missing in nearly every interaction with the providers at Swedish. And so we found a date that would work for MGH and for us, and prepared and delivered our presentations. Marin General treated us tenderly, actively considering our needs in ways that were healing for us, and offering us a vision of what hospitals could be—something we lost faith in after Talia was treated so carelessly by so many. Together, we shed tears with nurses, nutritionists, speech and respiratory therapists who were deeply saddened by the loss of our amazing Talia, whom they had come to know just a little bit through our presentations. We felt the outrage of the doctors there, who understood that an airway failure is a physician failure. Most of them heard our plea to be vigilant in communicating well with those on their care teams and with their patients; they understood how important trust is and how much work it takes to achieve it, since it requires respect and collaboration. Jon spent several hours with us discussing possible future scenarios for us, what direction we might take in helping to change the culture of medicine, where we might go with our infant organization, Talia’s Voice, which we had just decided to pursue. We felt an immediate affinity for him that continued to grow over the course of our time in Marin. 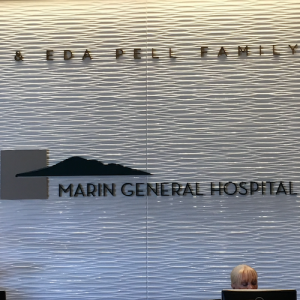 Lee Domanico, the CEO at Marin General, attended our talks and immediately reviewed policies and practices at MGH in light of what we had to say. We got to know the Executive Director of Patient Experience, Anna Sellenriek, as well. We bonded with both Jon and Anna, and through this new friendship, found support for our mission. They offered us a soft place to land, in a hospital setting where they are dedicated to patient safety. Even though they don’t always do everything right yet, they are committed to improving patient safety, which in some small way restored a whisper of faith in us with regard to the practice of medicine. Marin General offered us financial support as well as friendship: they gave us a most generous donation (and our biggest one to date). Our family—Talia’s family—gathered a few days ago for Thanksgiving. We feel Talia’s absence profoundly around the table, in the lack of her sing-song voice as she gushed over yummy food or resisted her brother’s teasing, or in the enthusiasm she expressed for her cousin’s endeavors or some new idea being discussed around the table. We understand how precious our relationships are because of what we’ve lost. We recognize what we do have, especially because of what we no longer have. In organizational terms, we at Talia’s Voice consider Marin General Hospital our family, too. They helped to birth us, and the personnel there continue to offer us support. We were thrilled a few weeks ago when a friend reported that her family member got great care there—almost like we’d delivered that care ourselves! We are grateful beyond measure, and have plans to make our “parent” organization proud. Thank you, Marin General, for helping to launch us, and for sharing with us a belief in our mission. I’m sure you feel wonderful, knowing you are making a difference in people’s care. Being heard is an antidote and I’m sure a healing. Kudos to Marin GH for your welcoming. You are so brave. You are changing care at medical centers with Talia’s Voice and should be so proud. Marin is blessed to have your profound and deeply personal input. We don’t want anybody else’s child, sibling, partner, or parent to experience a death like Talia’s. Our goal at Talia’s Voice is both simple and deeply complex: we want to change the culture in medicine so that nobody’s else’s child dies because the people in charge won’t listen. Talia used art – the process of creating it, and the themes she took up in it – to explore all facets of her experiences. Her artwork shows her willingness to confront unflinchingly all that life threw her way.